Jake loves to talk. Seriously loves to talk. This kid just will not stop talking. I am thankful and blessed that he is verbal; when he was two, I wondered if or when he would start to talk. By age three, I was relieved that he had a few favorite words and some very short sentences. I would never have called him expressive, however. Something happened though, between ages three and four. Jake really started talking, and he has not stopped since. There have been many, many nights when we have gone upstairs, late at night, to kiss his head while he slept, and marvel at how quiet he was, because it is never, never quiet here in the day. I first wrote about his talking here. I have been looking into the idea that Jake is a verbal stimmer (see below for definition). I have watched him a lot. When kindergarten started, he was chewing on pencils constantly, but I have never seen that at home. I have never seen any other real stims of any kind, though (for example, hand flapping). After his diagnosis, I started looking for them, but most of the stereotypical, obvious stims have never been a part of our lives. I counted myself lucky, and moved on, but now I am taking another look. He really just cannot shut up. He is getting better at waiting until we are ‘available’ to talk to him. But he often just goes off talking anyways, whether we are paying attention or not. There are times every day when I ask him to just be quiet for a minute, just a second, so I can hear what his soft-spoken little brother is trying to tell me. Thankfully, Aiden is becoming less soft-spoken all the time. But the noise level in our house is insane. Penny could sleep through a rock concert, I am entirely confident. She is trained for it. So what is verbal stimming? It is a couple of things. Jake finds joy in talking. I don’t know if it is the sound, the feel of the vibration in his throat, the movement of his lips, or some combination. But there are many times a day when he is just so happy to be talking. Often way louder than any situation in our little house could possibly require. This fits with what I have learned about stimming. It is something autistics do for happiness—apparently, an incredible happiness that is self-controlled and almost impossible to restrain from. The other thing about verbal stimming is that it can be calming and soothing for Jake when he is upset. He could be upset by anything or everything, and he gets loud. If he is upset because he sees that Aiden is hurt, I get a run-on, loud, lengthy, cannot-be-stopped-or-interrupted explanation of the event in super detail on repeat. If he is upset because there is a noise that he is bothered by, he may cover his ears, but he will often also start singing loudly. If he is upset because he is hurt, angry, frustrated, annoyed, or impatient, he will whine or cry, often with words. He cries over things that seem like smallest problems and screams over scraped knees. I have tried all kinds of things to help him calm down, from deep breathing to deep pressure to movement to distractions. The most effective, and often the hardest for me to do, is to simply let him cry it out. The more I try to get him to stop crying, the more frustrated he gets. I found this description of stimming really helpful. Sometimes stimming releases pressure—especially the good kind of stimming. Sometimes a stim will help us focus to block out invasive and overwhelming sensory input, becoming an essential coping aide. It’s a type of self-soothing, whether one needs to be soothed because something is just too cute or because that ambulance siren is just way too loud, the root cause is essentially the same. In my opinion, the question shouldn’t be why autistic people stim, it should be why do autistic people stim in such a specific way. Not every autistic stims, and not every autistic person shares all the typically autistic stims. I’m a finger waver, but I’m not often a hand flapper. I have a vast number of vocal stims, but I’m not usually a rocker or a bobber. I know hair-twirlers who rock back and forth. I know knuckle-crackers and foot-tappers who don’t wave fingers or flap hands. Every autistic is as unique as her own personal stimming lexicon. Neurotypical people stim too! Some notable neurotypical stims include tapping fingers or feet to music, stroking the face when stressed, or rocking in a rocking chair. A funny thing about that is that I totally get it. While I don’t cry over Lego that just won’t stay together in super elaborate creations, if I am actually crying, it’s incredibly difficult for me to stop. Once the emotions and sounds and tears start coming, the release is so powerful. I benefit greatly from vocal stimming. It keeps me more in more control of my physical body when I am overcome by miscommunications, anxiety, and too much of everything. BUT it really does attract a lot of attention. When I vocally stim, there isn’t much warning, and I have very little volume control. I try hard not to be too close to someone if I think I am going to be loud, for the sake of their hearing. But it’s difficult for me to control. I watched this video called, “Ask an Autistic – What is Vocal/Verbal Stimming?” It was amazing. If you have a few minutes, please watch it. It’s well done, hopeful, encouraging, and so, so good! I loved so many things about this. One was how lovely this speaker is, Amythest Schaber, how sweet and autistic. Especially if you don’t know many autistic people, this is a nice example of how real and nice they are, not strange or scary! She does a very good job explaining why it is important to allow verbal and vocal stimming, and how the real problem with it is when it is annoying for others who are around. She suggests that we need to change our perspective rather that stop the stimming. I agree with her. Completely. On principle. Jake’s non-stop talking does not hurt him, nor does it hurt anyone around him. But there are so many times that we are all going crazy! I know a few things that will help this situation, and the more I think about it, the more I realize they are powerful and possible. The first and most important thing is that we need to be less bothered by it. Truly, my husband and I can text each other if we really need to. But if I can recognize that it brings Jake joy, calms him and helps him, then I will be more patient, and I will be happy that he is doing well. If I can remind myself that it is okay, that all is fine and it is his way of coping with stress or creating and expressing joy, I will find peace and joy in that. The other is creating some boundaries. I can build on the ‘not available’ idea by creating times when it’s not okay to talk constantly. I can make a social story about watching tv with dad and how he likes to hear what the tv says. I can create some practice situations where other people are trying to talk and the noise Jake is creating makes it difficult. Finally, I have really noticed that Jake loves music. I hope to write more about that some time soon. But when there is music on, even softly, he listens, he sings, he dances, and he is calm. He does not talk nearly as much. I also love having music on in the house, so I can try to remember to use this when his constant babble becomes overwhelming. It may be time to just change the sound in the house to music rather than wish for a quiet that will never come. I can not say it enough. Learning about Jake’s autism has been such an incredible key to knowing him. It is affecting our family more and more. As we learn more and filter what we are seeing day to day, we are becoming better parents, more understanding people. However, I believe that this seeming lack of understanding does not truly correlate with a lack of empathy. I think it is more social cluelessness, as explained in this definition and example. What appears as a lack of empathy is probably just Jake trusting that I am mom and therefore I will always be fine and I am here to help with his needs, which according to him often include turning on the tv at the time of his choosing. I think it is more ego-centrism and cluelessness than genuine lack of empathy. Ego-centrism is just as common in people with autism as social cluelessness. In my previous post, I discussed the idea that autistics actually experience an overwhelming sense of empathy. This is not the only opinion, however. One writer I have really enjoyed reading is an adult on the spectrum who disagrees with the idea that autistics have an over-developed sense of empathy that is simply misunderstood. She also thinks there is nothing wrong with a genuine lack of empathy. This idea is supported by other bloggers, explaining that our definitions of empathy are the problem, not the actual lack of empathy. This suggests that yes, it is hard to identify with and understand another’s feelings and motives. In conversations with my husband, I would quickly say that we both struggle with this. Any one of our arguments can be traced to a misunderstanding of the other’s feelings and motives. Rather, we all need to work on empathy, and recognizing that it is a struggle for Jake and other autistics will give us more patience when we deal with them. When I was a kid, I couldn’t really empathize well. Without realizing it, I would say things that hurt people’s feelings (I still do). The aspie doesn’t really “think on the fly” during conversations. There’s a delay and we often don’t pick up on non-verbal or non-obvious cues that we’re hurting someone. However, this has little or nothing to do with the concern, care, and love that autistics feel towards others. It may not even be as important as it is often portrayed to be. Empathy has nothing – NOTHING – to do with love or one’s ability to care. Think about it. Have you ever loved someone that you just didn’t always understand? Maybe your autistic child? Beyond that, did you ever have a “crush” on someone who seemed so outside of your type? Just because you look at your child and can’t identify how he or she is feeling doesn’t mean you love him or her any less. Have you ever loved someone unconditionally? The definition of unconditional love seems to imply that it is outside of one’s ability to understand or do or say anything. They simply love. Yesterday we took Jake to Wal-Mart to look at the Lego. Just to look. It’s a reward for him, something special to do. While he was there memorizing all of the packaging, another couple and their kids came into the aisle as well. When it became clear that they were also there to look at the Lego and not just passing through, Jake quickly became uncomfortable. My husband, who like me is quickly learning, got down at his level and had a quick, quiet conversation. 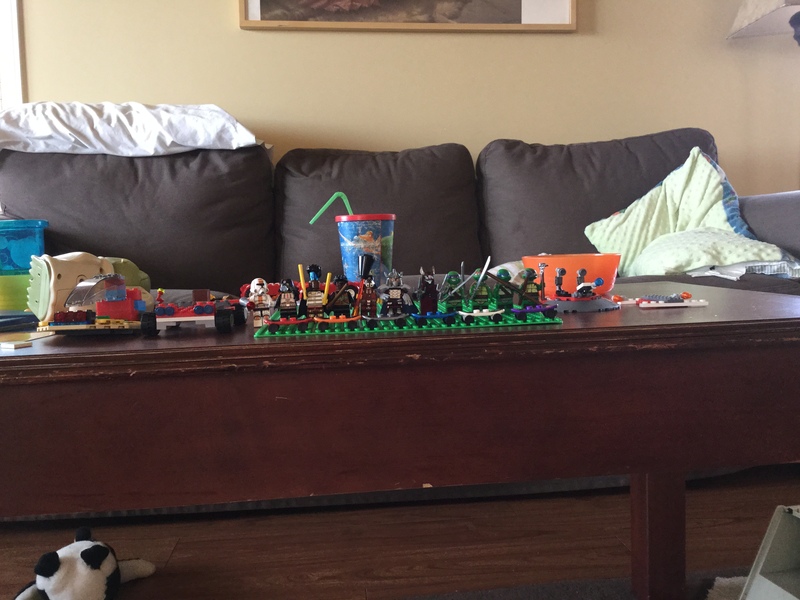 Jake explained that he ‘didn’t want to cause trouble when we [Jake and his dad] have to leave.’ As in, walking out of the aisle past these other people would disrupt their Lego looking and be uncomfortable. So they solved the dilemma by agreeing to leave out the far end of the aisle. This to me screams of both the ability to care and the ability to put oneself in the position of another. However, it doesn’t actually relate to true empathy according to the definition. Jake and his dad treated the other people in the store the way that they would have wanted to be treated if they were in the same position. Treating others the way they want to be treated. A lovely way to treat people, but not actually understanding what the other people DID want. They may have been looking for a gift and wanting Jake’s suggestions. Because no conversation happened, no actual understanding of another’s motivations happened. No one had any idea of the others’ feelings or situation. In fact, my husband was the only one in this particular scenario to truly demonstrate empathy, and it was towards Jake. I think that teaching our kids to be kind, to care, to listen and understand other people is what is important. Eventually this will translate to sympathy, and when it really matters, empathy. But all kids and even adults need to work on it. Knowing that the mental gymnastics required are quicker, more difficult for autistics is something that will help me to be more patient and sympathetic.